Mexico became Friday the first developing nation to submit targets for UN climate change talks in December, pledging that its greenhouse gas emissions will peak in 2026 before falling. Mexico follows the European Union, Norway and Switzerland in presenting commitments that nations must make public by March 31, providing the backbone for a global climate deal in Paris. 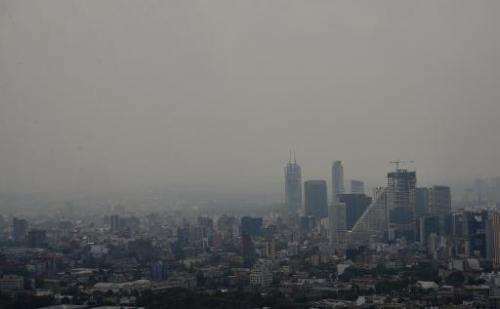 The Mexican government's plan foresees emissions peaking in 2026, with greenhouse gases falling 22 percent and black carbon dropping 51 percent by 2030. "It's a very ambitious target, but joining our efforts... we are convinced that we can reach it," Environment Minister Juan Jose Guerra Abud told a news conference. The global talks will seek a pact that will enter into force by 2020 to further the UN goal of limiting global warming to two degrees Celsius (3.6 degrees Fahrenheit) over pre-Industrial Revolution levels. The United States applauded Mexico for being the first major emerging economy to submit its so-called Intended Nationally Determined Contribution, with the White House saying it was "setting an example for the rest of the world." "Mexico's target to peak its emissions by 2026 and drive them down thereafter is a landmark step in the global transition to a low-carbon economy," the White House statement said. US President Barack Obama and Mexican President Enrique Pena Nieto also announced a high-level bilateral task force to "further deepen policy and regulatory coordination in specific areas," including clean electricity and promoting more fuel-efficient automobile fleets in both countries. Some smog-lover voted this down. Where do we find those folk? Does everyone know that China has used more concrete in the past 10 years than the United States has in the past 100? Go fornicate with the Chinese and leave Western Civilization alone.